In food processer mix all ingredients. TIP: If you add melted butter last, it helps to keep the powdered sugar from poofing up on the lid of the processor. (Yes I know poofing is not a word, but that’s what it does!) Keep processing and scraping down the sides until all is mixed, and there is no powdered sugar lumps. Refrigerate until cold, about 30- 40 minutes. Roll peanut butter mixture into balls about the size of walnuts, and dip into melted chocolate one at a time. Lifting each little ghost out of the chocolate with a spoon or small spatula, place on cookie sheet lined with parchment paper. 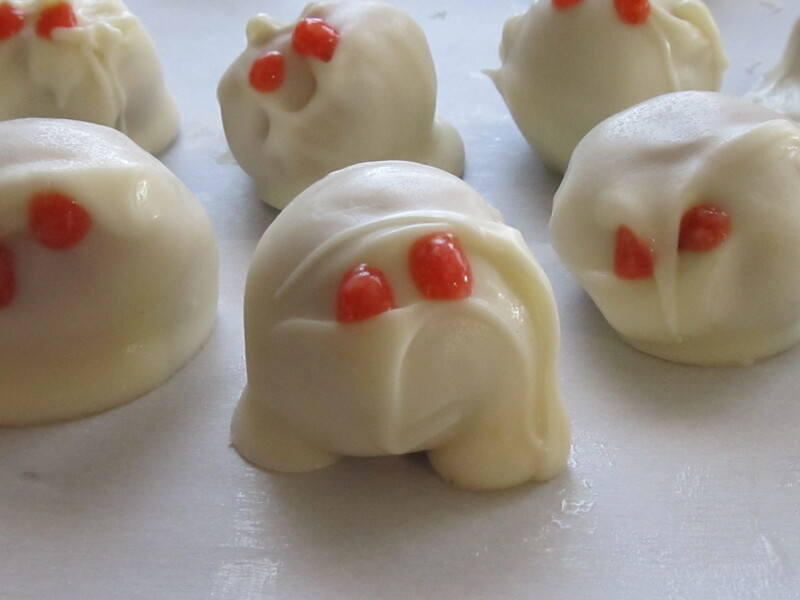 They don’t have to be perfect, when the chocolate starts to run it will look like a ghost. Depending on how big you make them, it will make about 4 -4 1/2 dozen. Melting only half the package at a time in a small glass bowl for about 2 minutes, or until smooth when stirred. When the almond bark starts to get thick add more bricks to the bowl and microwave for about 2 minutes. Make sure not to get any water in the almond bark, it will make it gritty. 5 to 6 frozen strawberries, or blueberries, puréed in food processor. You can thicken the fruit with powdered sugar it you want. I didn’t because I like the red eyes. The powdered sugar mixed with the strawberries will give them pink eyes.